there’s an adage that says: “those who can, do. those who can’t, teach.”. 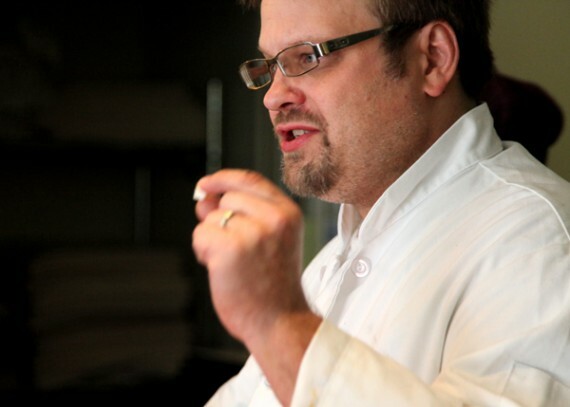 clearly, that’s not remotely accurate as many wonderfully productive people can also teach up a storm, particularly the talented dave anderson, executive chef at madeleine bistro. ever had one of his ice creams that are so light and flavorful that you want third helpings? 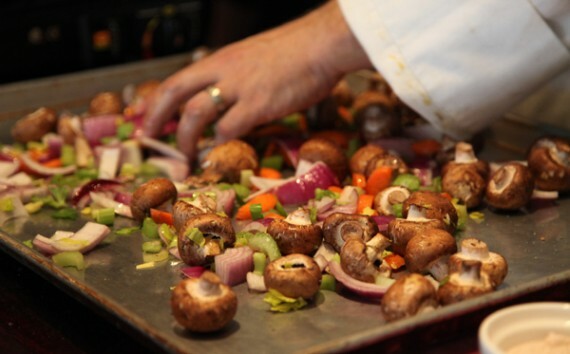 ever eaten chunks of his pan-roasted vegetables by the dozen? ever wondered what goes into making such sublime sauces? well, if you have (and if you’ve ever eaten at madeleine’s you’ll be on the same page here) are you not just a little intrigued as to how dave and the team invent, prepare and cook such amazing food? 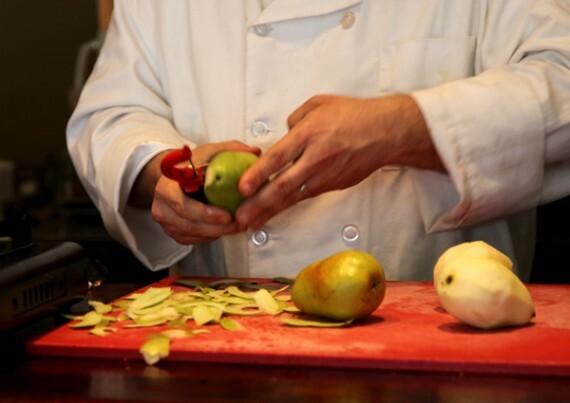 thankfully for curious minds, madeleine bistro offers cooking classes/demonstrations on the weekends (the next one being this saturday!) where average folks like you and me can not only learn some of chef dave’s secrets, but enjoy an artfully-prepared three course meal as well. 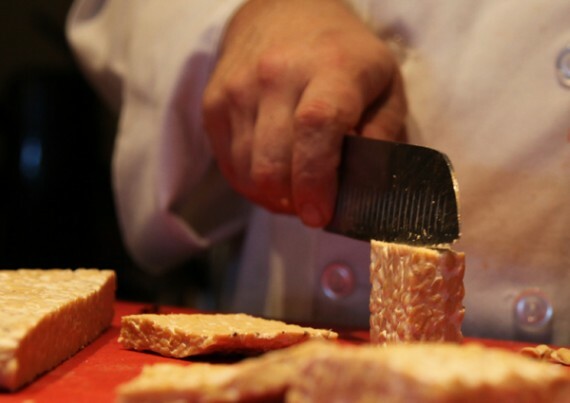 we sat in on the most recent class and gained some culinary wisdom that will last a lifetime. 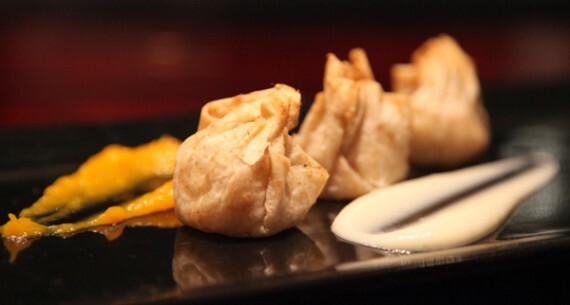 pan-roasted califlower in filo with roasted butternut squash and cauliflower puree. the class we attended included recipes and instruction on three separate courses, with the focus being on roasting and braising. the first course, pictured above, was pan-roasted cauliflower in filo with roasted butternut squash and cauliflower puree. 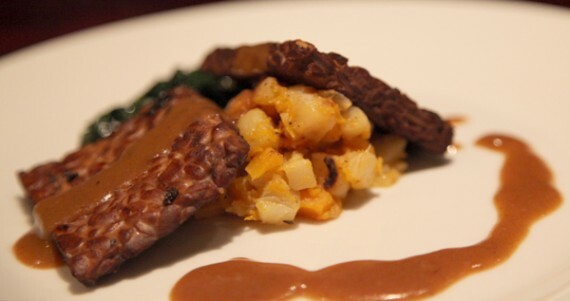 for the main course, chef dave schooled us in the art of braising with braised tempeh, braised root vegetables, and cabernet-roasted mushroom sauce. 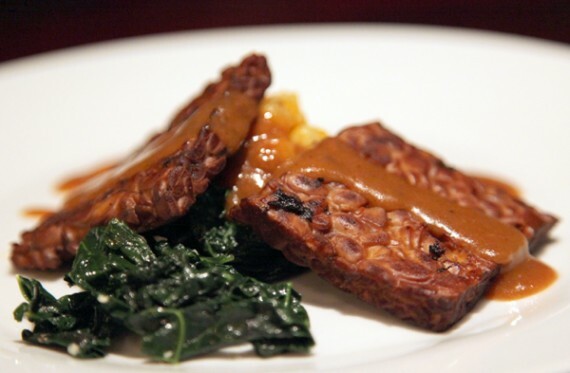 braised tempeh with braised root vegetables and cabernet-roasted mushroom sauce. everything in this course was wonderful, from the finely cubed vegetables to the browned tempeh slices and flavorful sauce. again, we saw the process from start to finish. i have never learned so much in two hours! and the finished product was just exquisite, vegans and non-vegans alike were singing its praises. lastly, even our dessert course implemented braising and roasting techniques. 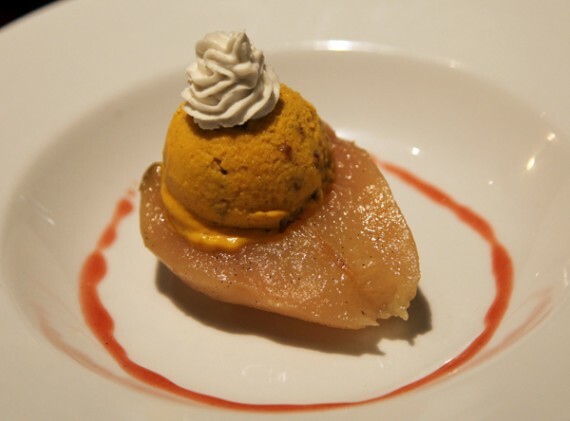 the last course consisted of pears braised in riesling, agave and vanilla bean, along with homemade ice creme made from baked sweet potatoes. the dessert turned out perfectly, and i loved every last bite even though i’m not a big sweet potato or pear fan. seriously, i was licking the plate. when it was served, it even came with a dollop of dave’s special coconut whip cream (which he would not give away the secret to). overall, the madeleine bistro cooking class was a huge success. the students gathered around in the dining area and watched intently as chef dave prepared each course and explained his methods. the students didn’t do any actual cooking themselves, but were free to take notes and ask unlimited questions. i really enjoyed the way chef dave ran the class, and i left with a stack of invaluable recipes and a wealth of knowledge. plus, dave was ridiculously funny and laid back throughout the lesson, making for a really fun environment. 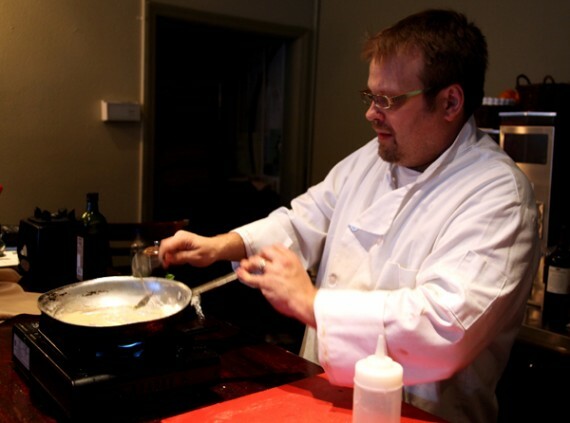 madeleine bistro usually hosts cooking classes every other week, the next one being this saturday march 6th. each class is $75 per person, which includes a 3-course meal! money well spent, if you ask me. 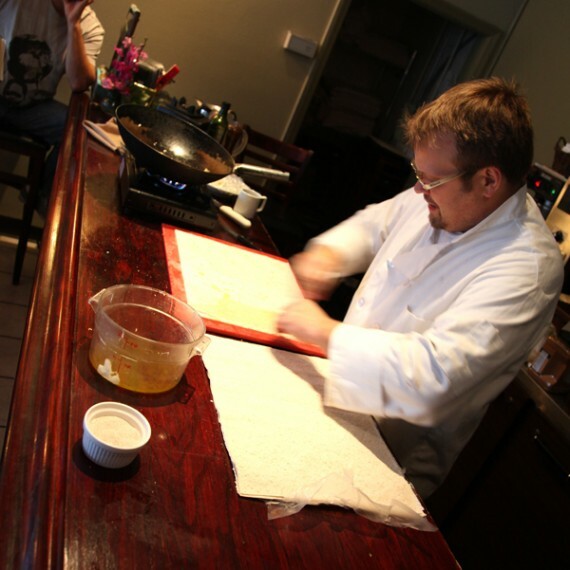 so be sure to contact madeleine bistro and sign up for the next cooking class that you can. hope you love it as much as i did! Such great pictures… that first one begs for a caption competition, but I’m not that creative this morning so I can’t think of anything funny. Dave Anderson is amazing, and I had no idea he taught classes. I’m going to get my mom on one of those when she’s in town next month. So Dave Anderson comes out of the kitchen and cooks food in front of you? WOW. I’m going to get on the next class. I always thought braising and roasting were the same thing. Clearly, I have much to learn. I took one of Chef Dave’s classes a while ago and it was GREAT! I’m such a fan of Madeleine’s and its owners. It’s awesome you’ve gotten to take a class, too! That looks great! Have you taken a Spork Foods class yet? Really good. Really, really good. And a little closer to home! Due to extreme and total laziness, I don’t cook and I live on vegan salads, sandwiches and take-out. However, for people who are more motivated in life, this looks very cool. I hope more and more vegan chefs start to exist and have their own vegan cooking shows and things of this nature. Wow, great pictures! I cant wait to take a class. I am calling them and trying to get in on the next one! My friend Jackie and I were at that same cooking class! 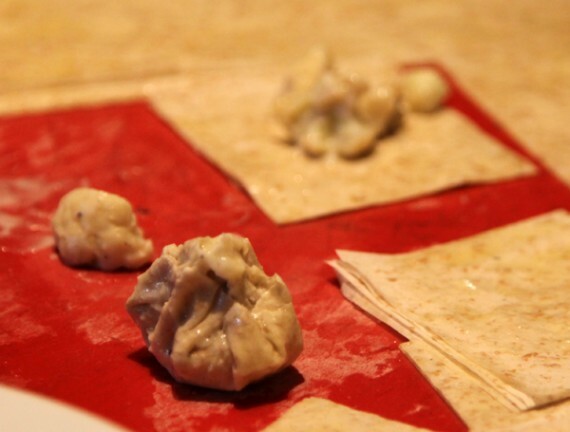 That night I made the tempeh and braised root vegetables, and the next day made the filo cauliflower pops. Amazingly – they all turned out! 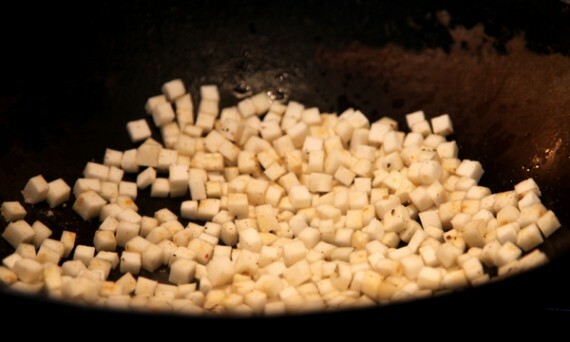 I love all the great cooking tricks and tips he passes along during his classes. I love the pictures! I am so glad you captured the class. You guys are so sneaky! I wish I knew you were in the class. I guess you didn’t want us all bugging you and telling you how awesome your blog is! 😉 The class was great and the food, to die for! Just wish Dave would share more “secrets”, but who can blame him?